The participation or involvement of team members in every activity and team undertaking is an essential part of the team’s successes. If you want to be efficient as a group and achieve common goals and objectives, you have to make sure that your team members are fully aware of their responsibilities and obligations. This can be done with the help of a team agreement. 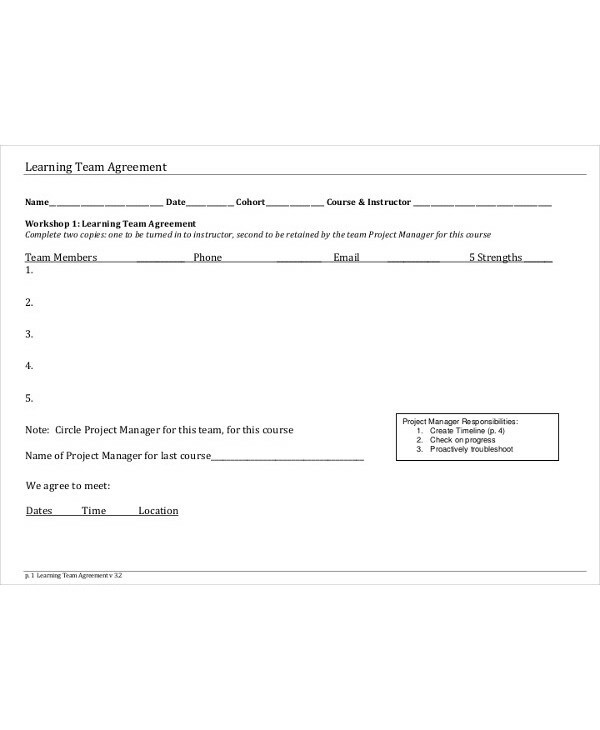 Just like when developing a joint venture agreement and a free partnership agreement, we highly recommend the usage of templates and downloadable examples when making this document. 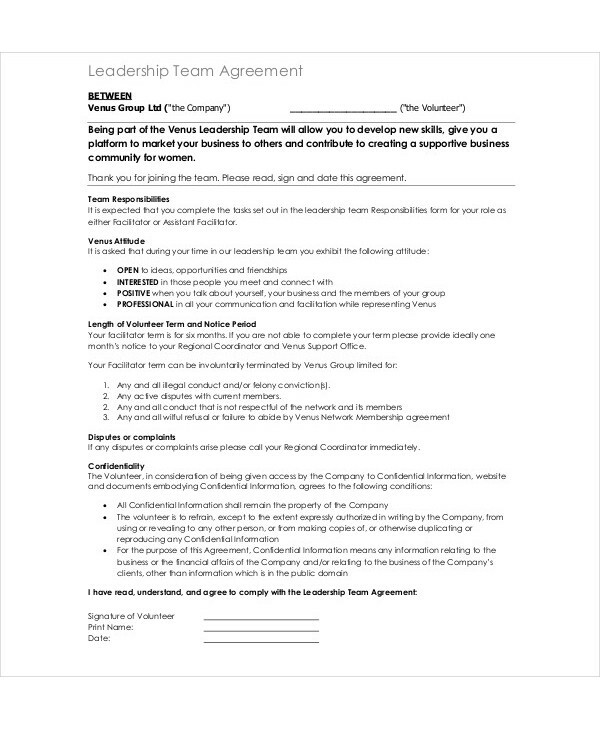 Refer to our printable and downloadable team agreement examples for references. 1. A team agreement presents an overview of the current situation or condition of the team and the items that are needed to be remembered by team members all the time. With the help of a team agreement, it will be easier for all team members to be aware of the communication guidelines that they need to follow as well as the responsibilities that they each have. You may also see commercial agreement examples. 2. 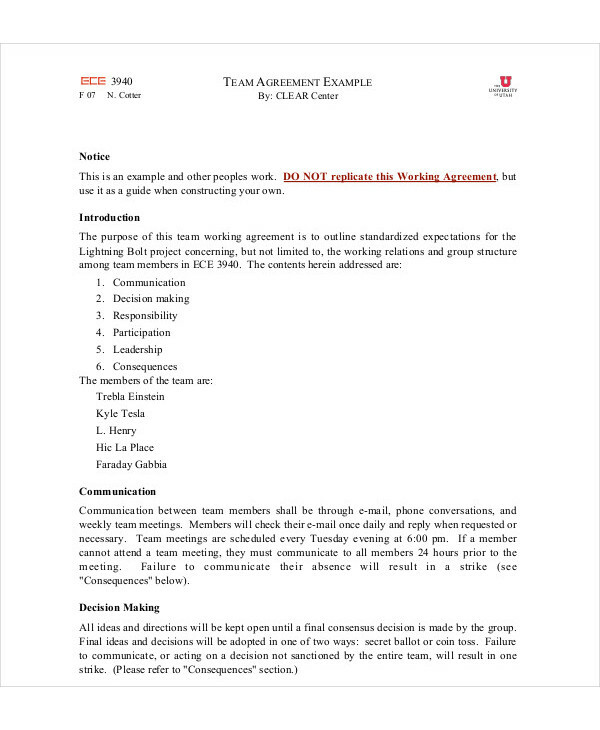 A team agreement can provide a thorough discussion of the consequences that team members can face if they will not follow the items listed in the document. This can include concerns about productivity, workplace efficiency, team participation, and overall effectiveness. You may also see management services examples. 3. A team agreement helps a lot in terms of decision-making processes. With this document, teams can have a guide or a reference whenever there is a need to come up with sound decisions that can help the team function at its best. 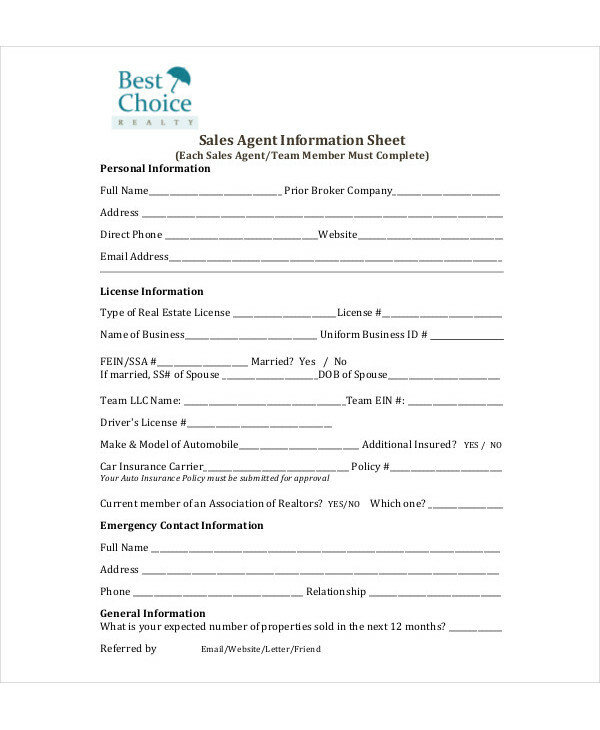 You may also see real estate investment agreement examples. 1. Ensure that you will involve all team members in the development of the team agreement. All items must be agreed upon by all members so that you can have an idea about their stand when it comes to the agreement items or clauses that you have presented. 2. 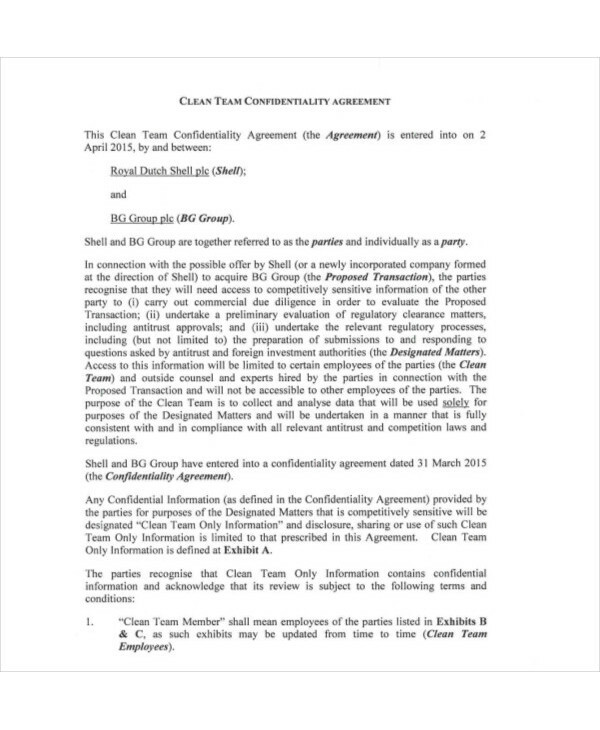 Make the team agreement as clear and as transparent as possible. Make the document objective and specific enough so that the team members can feel that their rights as employees are also protected as they follow the content of the agreement within their employment and/or association with the team. 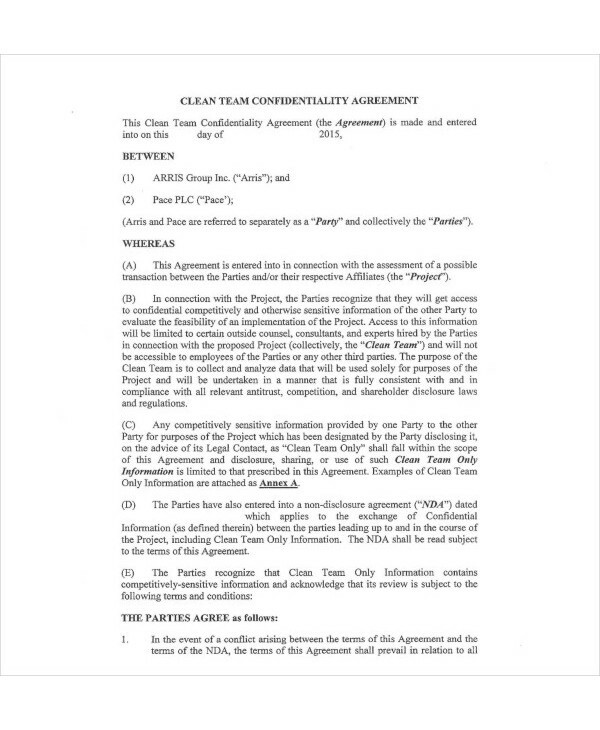 You may also see computer confidentiality agreement examples. Camaraderie and responsibility ownership can be established within your team if you will create a team agreement that can clarify all the expected deliverable from your team members. This document can also help you to maintain a healthy relationship with your team members which is a great way to ensure a great collaboration when it comes to fulfilling the demands and needs of the business. Listed below are some of the tips that can help you come up with an impressive team agreement with ease. You may also see purchase agreement examples. 1. Just like when creating joint promotion agreements where you first make a checklist for drafting joint promotion agreements, you also need to have outlines and drafts when making your team agreement. This will allow you to finalize all the items that you will include in the document which in turn can also help you have an easy time formatting a complete and presentable team agreement. 2. All the details in the document must be realistic, attainable, and measurable. Make sure that the entirety of the team agreement has been reviewed and looked into. 3. Maximize the usage of templates and examples. You can create a better team agreement if you can be well-guided in the development not only of the information that you would like to discuss but also of the format that you will use for your presentation. More so, this can make the team agreement look more business-appropriate and formal. You may also see promotion agreement examples. Again, do not forget to browse through and download the examples that we have put together in this post. It is better for you to immerse yourself in team agreement creation processes if you already have a variety of document formatting and content development guides at hand. You may also see contractor agreement examples.